Pass a hair drug test by using Hair Follicle Shampoo. This shampoo gives you a clear zone™ for up to 8 Hours. It has a simple two-step process. Using it will mask all the toxins within minutes. It is suitable for any hair length. It has no side effects and safe for the hair and scalp. Note: The result of this product is temporary. So use this product on the day you wish your hair to be clean. ✓Avoid the toxic environments during this two–step process. ✓Evenly distribute the entire contents of the shampoo bottle to wet hair. Massage the hair thoroughly for 5 minutes and then rinse with warm water. ✓Then evenly distribute the entire contents of the PURIFIER bottle to wet hair. Again massage the hair thoroughly and leave it for 15-minutes,then rinse with warm water. ✓Use a clean towel and clean comb/brush. DO NOT blow dry your hair. DO NOT use any other hair care products following use of this treatment. DO NOT allow hair to touch surfaces that may contain toxins. 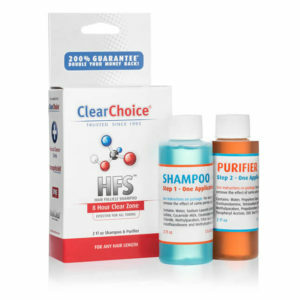 Clear Choice claim this product is guaranteed for up to 8 hours after application. Maximum effectiveness is achieved within the first hour. Click here to read more about hair testing.